It’s 10 PM, Do You Know Where Your Fasteners Are? While some fastener manufacturers and distributors get involved with customer product design, more often than not, they are simply asked to quote and provide a fastener to a print or industry standard. A reputable supplier can ensure the specification requirements are met, but where it goes from there is all up to the customer or end user. Any fastener industry veteran can tell you that nine times out of ten it is the joint design and installation technique, not fastener quality, that is at fault when a fastener fails. So knowing how and where that Grade 8 bolt you sold is being used may not keep you up at night, but the ensuing argument when parts and assemblies start failing sure can. Fasteners more prone to failure under service loads. Thread strip may occur undetected at assembly leading to a compromised joint. Mating components may be damaged. Insufficient clamp load cannot resist service loads, leading to joint failure. Fasteners are more susceptible to fatigue failures. Joints will be less resistant to vibration and other loosening effects. Regardless of whether the fastener was at fault or not, you can be assured that any one of these situations will lead to a call from the customer. At this point the reader is likely thinking, “These are the manufacturer’s responsibilities and within their control. I can’t afford the resources to do my job the way I’d like to, never mind help with theirs.” True as those points may be, trends show increasingly competitive markets with direct online purchases gaining traction and setting a low floor for prices. Sitting pat isn’t a safe bet for a sustainable future. Rather, providing supporting services your customer needs and recognizes will be an increasingly important differentiator. While reacting to problems effectively when they arise can build credibility, the best way to add value and build customer loyalty is to proactively work to prevent them. The problem is the vast majority of joints don’t cause problems that put your fasteners in a bad light, and joints that will become problems are rarely obvious until it’s too late. So short of hiring a team of experienced application engineers or enlisting a fastener consultant, what steps can be taken? What is the nature of their assembly equipment? Is there a dedicated rework area? Are there scrap bins along the assembly line? Is there a new package of parts being quoted, possibly indicating a new product launch? Is there a heavily revised fastener print, possibly indicating joining issues the customer is chasing? It doesn’t take a lot of expertise to ask the questions, but having the capability to address any red flags that might be raised is another matter. Because fastening is an assembly process, understanding it requires applicable manufacturing experience combined with in depth knowledge of exactly how bolted joints work. This is an increasingly rare set of skills and experiences. Whether to invest in resources capable of preventing or troubleshooting problems, or to contract that capability to others is a complex decision beyond the scope of this article. It comes down to assessing whether in-house capability will provide sufficient competitive advantage relative to contracting the need to those few people that specialize in it. Peak Innovations Engineering was contacted by a fastener manufacturer whose customer was reporting that a nut and bolt combination was stripping threads at the specified assembly torque. 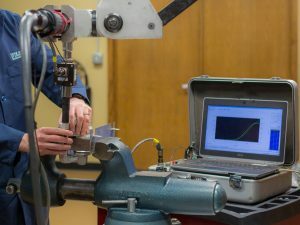 Through the use of the latest ultrasonic measurement techniques, Peak performed an in-joint torque-angle to failure test while continuously monitoring bolt tension. 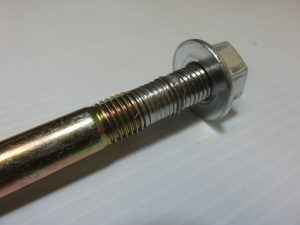 It was found that while thread strip was the failure mode, it occurred above the bolts’ yield point and well above the stated assembly torque. With reliable data in hand, the fastener manufacturer was able to work with their customer on diagnosing the torque control problems at assembly. The cost to the fastener supplier for this definitive test that provided quantitative answers to what was a stalemated disagreement was $3,475. Both the supplier and their customer benefitted. In closing, companies like Amazon are changing the way products are bought and sold, and it is time for industrial distribution to take note. To stay relevant, fastener suppliers will either have to find a way to be cost competitive with internet sales models, or offer services that truly add value to their customers. With dedicated fastener engineers going the way of the dodo bird, finding a way to provide joint design, validation, and troubleshooting should be of particular value. So ask yourself, do you know where your fasteners are?